Filip Twardzik, who has already broken into the first team squad, and twin brother Patrik have both signed contract extensions with Celtic. The former, who has made five first-team appearances and can play left-back or midfield, has committed his future until 2015. Midfielder Patrik, who was a regular goalscorer for the Celtic Under-19s, has signed a one-year extension. His deal with the Scottish champions now ends in summer 2014. 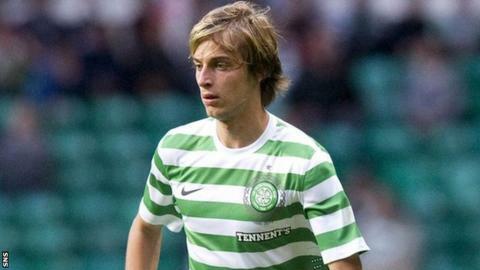 The 19-year-old Czechs first arrived at Celtic Park in 2009. Filip, who is awaiting the results of a scan on a groin injury, made his debut as a substitute in a 3-0 Scottish Cup win away to Peterhead in January, making his first start in August in a 4-2 win away to Inverness Caledonian Stadium in the Scottish Premier League. He told Celtic's website: "We have learnt a lot since we have been here. "The physical side changed a lot, but we are still the same players we have always been, our bodies have just progressed. "I want to stay in the first-team and hopefully win some more medals this year." Patrik has set his sights on following his brother into the first team. "I have always dreamt about being the best player in every age group, so I want to get there," he said. "Filip is closer to it than me, but I will get there."